•Transitional Master Suite located in Bala Cynwyd, Pennsylvania. The vanity features custom 3-DL cabinetry by Bremtown, Caesarstone quartz tops, Kohler sinks and faucets, and Robern medicine cabinets. The shower features natural clefted stone which contrast nicely against the island stone floors and Grohe fixtures. The free standing Jacuzzi tub with Kohler tub filler is the star of the show, with natural clefted stone as a backdrop. The room is finished off with original art by Andrew Cerami and radiant floor heat to enhance the spa like feel of the bathroom. The adjacent bedroom displays a beautiful run of Bremtowns custom cabinetry in an Ivory matte finish and built in bench seat. This transitional master is featuring white painted inset cabinetry with a shaker doors. The double vanity and make-up area provide plenty of storage, complete with electrical in the cabinets for ally your grooming needs. 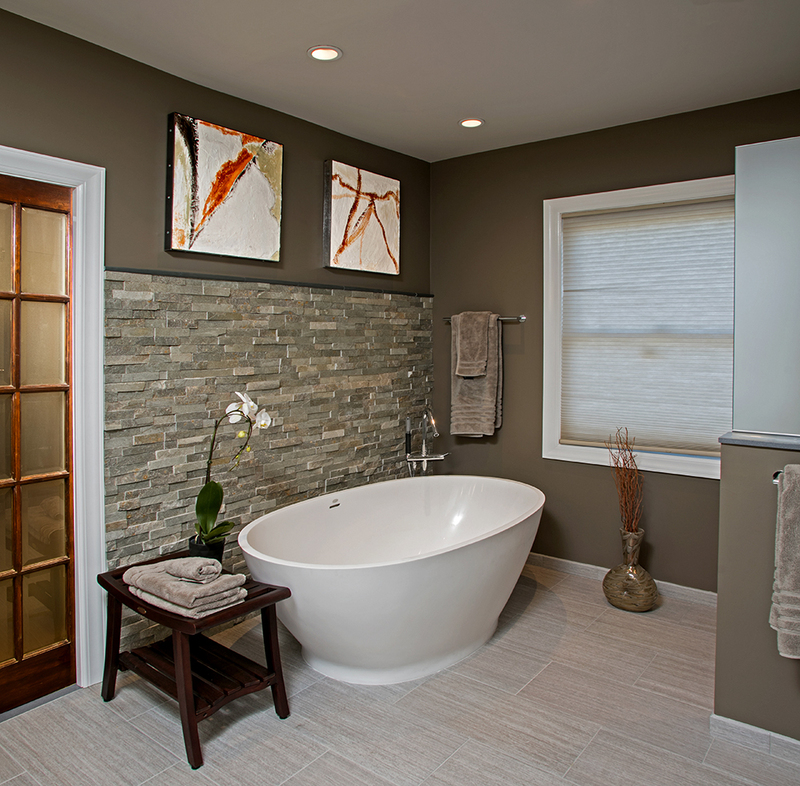 This transitional master bath in Lafayette Hill, PA has a very clean open feel. The traditional style of the subway tile is displayed beautifully in the custom frameless glass shower. The transitional style vanity in this Lafayette, PA home features a built in linen cabinet and mirror, the look is complete with pendent light fixtures. Here is a close look at the fine detail of how the countertop backsplash, molding, and cabinet/mirror frame all come together. This transitional master bath in Lafayette Hill, PA displays the tub deck that leads into the shower to create the shower bench. The shower is finished off with a custom frameless enclosure and oil rubbed bronze fixtures. New make-up area in matching espresso finished cherry cabinetry outside new master bath in this transitional design in chester Springs, PA. .
New espresso finished cherry "his and hers" vanity featuring Pietra Cardosa limestone with elevated rear wall and continuous shelf. Whirlpool tub featuring Kohler Pinstripe Collection fixtures, naturally clefted slate tile and Pietra Cardosa limestone tub deck. New open spa shower featuring island stone floor and border with slate stone tile. Hotel shelf with hanger/hook option. A great way to store towels! The pebble floor gives the shower a more spa-like experience and dark emperador accents enrich this transitional shower in Blue Bell, PA. This trasitional Bathroom in Blue Bell, PA features light emperador marble tiles on the floor which contrast nicely with the dark emperador countertops and mosaic backsplash. the recessed mirror and vanity provide plenty of storage. Transitional Master Bath in Malvern, PA.